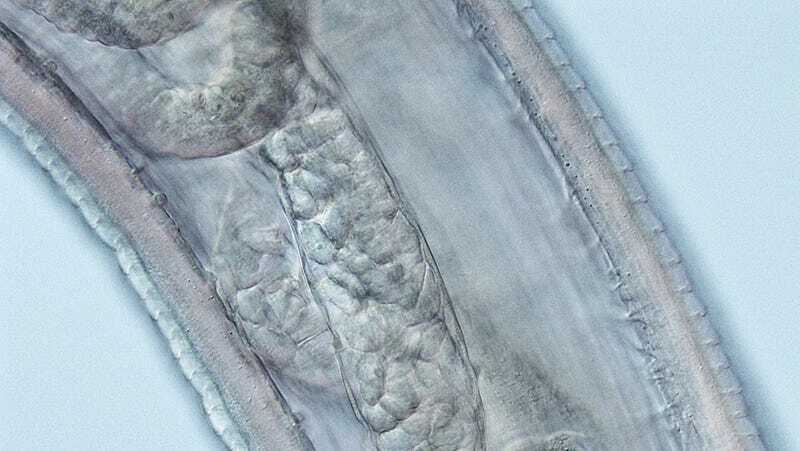 It’s a medical discovery you’d hate to be part of: A 26-year-old Oregon woman is believed to be the first human ever reported to be infected with a certain species of eye worm. The woman’s case, reported in the American Journal of Tropical Medicine and Hygiene Monday, began in the summer of 2015, soon after she returned home from a ranch in Gold Beach, Oregon, where she had been horseback riding. She first felt a irritation in her left eye, along with the nagging feeling that something was stuck in it. Eight days in, she made the sort of find you’d expect to see in a meandering, boring spin-off to Cloverfield—a small, translucent worm in her eye. After Beckley found and removed four more worms, she finally went to a doctor in Alaska, where she was staying. Beckley then went back home and saw a parade of doctors who each took out their own respective souvenirs. Rather than give her anti-worm medication (which is often used to treat infections of this parasitic worm family in humans), the doctors opted to have them all manually extracted through tweezers and irrigation of the eye. By day 20, the symptoms finally stopped, but only after a total of 14—14!—worms were pulled out. After samples were sent to the Centers of Disease Control and Prevention, scientists discovered that the worm was a member of the Thelaziidae family, but not one of the two species of worm already shown to infect people. Instead, it was the cattle eye worm, known as Thelazia gulosa. Beckley’s ordeal is also only the 11th recorded case of any Thelazia infection, or thelaziasis, to have occurred in the U.S., and the first to be seen outside California or Utah. Thelazia worms are spread by species of flies that look pretty much like your typical house fly. The major difference being that these face flies, as they’re known, love to gobble down on other animals’ bodily fluids for nourishment, especially their tears, where they inadvertently pick up eye worm larvae. These tiny worms nestle in an animal’s eyes, mature, meet up to do the dirty deed, then lay larvae that are sucked in again by flies. The larva mature for a bit in the fly’s gut, then migrate to the fly’s mouth, where they’re spit back out into some other animal’s unsuspecting ocular orifice and can begin the cycle of life anew. Yum! Human Thelazia eye infections are definitely rare, but cattle fall victim to these worms pretty regularly. Some research has shown that up to a third of cows in the Northern U.S. are jam-packed with eye worm larvae during the summer months. The summer also happens to be when all known human infections have happened. “This patient’s outdoor pastimes of riding horses and fishing during the summer months likely allowed exposure to vector face flies, and she may have delayed brushing away of these flies from her face,” the authors wrote. Most infections do clear up with no lingering consequences once they’re removed, but sometimes the worms can scuttle across the cornea, causing scarring and even blindness. Thankfully, Beckley is no worse for the wear. “Today it’s a normal student college life and my eye is fine and I’m totally fine,” she said.